Walter, a young pigeon, is thrust into a world filled with danger and excitement after fleeing his family nest which is attacked by a wildcat. Following his traumatic departure he finds friendship and support from a flock of city dwelling pigeons. Walter befriends a mentor, named Old Dude, who helps him learn to read (and eventually type), allowing him to talk to humans. When threat of a cataclysmic event arises Walter becomes a critical part of the solution to the world's imminent demise. Readers will relate to Walter's struggles, and rejoice with him in his successes. The characters have wonderfully engaging personalities and their conversations are simply enchanting. This is truly a wonderful story, one which kids will want to read and re-read. There is humor, love, adventure, drama and excitement. The author introduces scientific concepts in a manner which educates while entertaining young readers. The information presented about pigeons is fascinating. A delightful character, Walter always strives to excel; he is a proud, but humble bird with great determination! 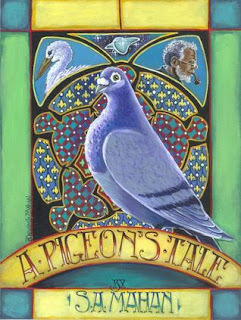 S.A. Mahan's A Pigeon's Tale is highly recommended for home and school libraries and has earned the Literary Classics Seal of Approval. Congratulations! I loved this book!! !